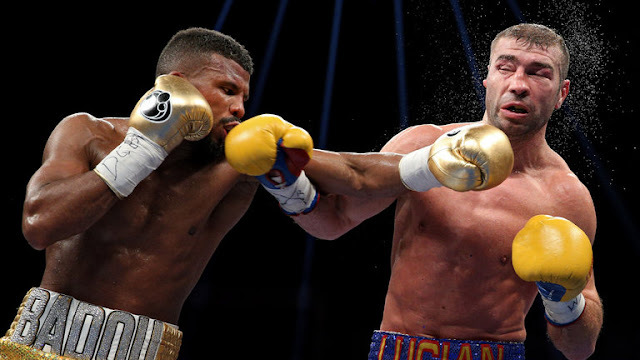 Well, Badou Jack (20-1-1, 12 KO) surprises – me, at least – once again, making easy work of Lucian Bute (32-3, 25 KO). Jack was robbed of a unanimous decision when it was somehow ruled a majority draw. The scorecards were 117-111, 114-114 x2. The 117-111 scorecard was the most accurate assessment. The good news is that Jack retains his WBC Super Middleweight title and will fight against IBF champion James Degale (23-1, 14 KO) in a unification later this year. Jack's hand speed was faster than I recall; Bute's was slower. With a high guard, elbows in tight, Jack's punches were shorter. There is nothing fancy or unorthodox about Jack; he is textbook perfect. Expected to pressure Jack throughout, Bute instead waited on Jack. With his faster hands, Jack beat Bute to the punch while Bute stood there posturing. If Bute threw a single punch, Jack stepped back; Bute resigned himself after a single punch. The game plan for Jack was to be first, step out of range, and circle away from Bute's left hand. That he did with ease for the first five rounds. Bute was more active in the sixth round with arm punches in which he did not step into flurries of arm punches, looking more wasted than he was. In the second half of the fight, Bute's corner told him to pressure Jack. Bute had his best round in the eleventh where he outworked Jack. Jack's power was always to the body. His jab and straight left to the head were fast and snappy, but not powerful; the thud was heard when he landed to the body. Unusual for a man who fights long and tall, Jack dominated Bute in body work 107-23 respectively.